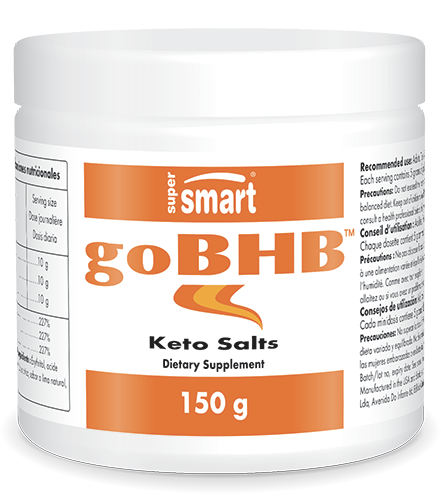 The new dietary supplement goBHB™ is formulated from beta-hydroxybutyrate (BHB), one of three ketone bodies present in the human body. These are produced by the body under quite specific conditions in a process called ketogenesis which only occurs when our carbohydrate reserves are too low to produce energy. Synthesised by the breakdown of fatty acids, ketone bodies then serve as alternative energy sources so that the body can function properly. Once present in the body, ketone bodies including beta-hydroxybutyrate are transported to various cells to provide the energy they need. Some cells, such as those in the muscles, heart and brain, have very high energy requirements. That is why BHB supplements are becoming increasingly popular with sports people whose energy needs are considerable. A number of studies show that supplementing with beta-hydroxybutyrate can help preserve energy stores in the form of glycogen. This can then be used as a secondary source of energy, thus helping to improve sports performance. Beta-hydroxybutyrate dietary supplements may also play a central role in the success of a weight loss programme. A dieter’s carbohydrate intake is often very low and an alternative source of energy can help prevent the urge to snack by providing fuel to support the body’s activity. By reducing the risk of failure, beta-hydroxybutyrate supplementation may therefore constitute a valuable aid to weight loss. As well as offering a source of energy to enable the body to function properly, beta-hydroxybutyrate may also be a powerful neuroprotective agent. A number of researchers have suggested that this ketone body may help increase levels of certain neurotrophic factors, including BDNF (Brain-Derived Neurotrophic Factor). BDNF plays a key role in the nervous system, contributing to neuron growth and survival. The benefits of BHB can now be obtained through dietary supplements. Providing optimal efficacy, the goBHB™ product we offer is formulated from magnesium beta-hydroxybutyrate. It comes in sachets, each one containing an optimal amount of 5mg of goBHB™, with a suggested dose of two sachets a day, to be dissolved in water. This dose can, of course, be adapted to your needs and the advice of your therapist. As part of a weight-loss regime, BHB’s benefits can be combined with those offered by our wide range of effective slimming products, such as Advanced Fat Burner and the powerful Weight Loss Formula.